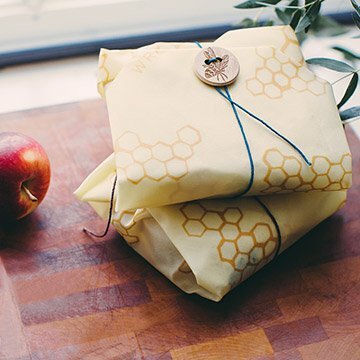 This reusable sandwich wrap is handmade from cotton infused with beeswax and natural oils. Sarah Kaeck resides in Vermont and is a mother of three, an avid gardener, seamstress, and keeper of goats and chickens. Sarah works alongside a group of women in Bristol in a workshop tucked at the edge of a winding river. Wash your Beeswax Reusable Sandwich Wrap in cool water with a mild dish soap. Avoid sources of heat, such as hot water and microwaves. Air dry, fold and store in a drawer or in a basket on the counter. My Grand daughter will love this !! This product performs exactly as advertised! Sturdy, flexible, eco-friendly, and waste-reducing. The only downside in my experience thus far has been that it can be difficult to get some condiment stains out of the wrap, even with soap. A cute and useful gift for my girlfriends. My daughter first bought me one as she knows I'm trying to cut out single use plastics. I will probably buy Bees Wrap for the rest of my life! I use this product to Wrap my sandwiches, crackers, nuts, grapes and many other things. It saves the environment because it cuts back on the use of plastic bags, it is cute, and it is reusable. I used it every day this summer for work, brought it hiking and other places and it was just as good the last day as the first day. I'm a huge fan of Bees Wrap! All natural product that eliminates a plastic and tinfoil needs that take lots of energy to produce and hundreds of years to decompose. While recycling is a bonus, many times the production of even a recyclable product uses lots energy to make it in the first place. Beeswax wrap superior at production as well as re-usability. love that the beeswax reusable material not only saves me money but saving my environment from all the plastic baggies i been throwing away in the past. This wrap is amazing. I was using so many zip-locks that I did not feel good about it, so I began looking for alternatives. I bought a medium sized flat sheet and then someone gave this item to me as a gift. The first time I used it to wrap 2 slices of pizza and it worked really well with the button/string closure, fitting over an odd-shaped object. I would purchase more of these in the future. A nice concept but only lasts one year.